Whether it is a place to unwind at the end of a day or gather with friends, man caves are a great addition to any home. When they are done well, a sophisticated man cave offers premium relaxation and entertainment options, and a classy room that adds to the style throughout your home will always get the wife’s stamp of approval. 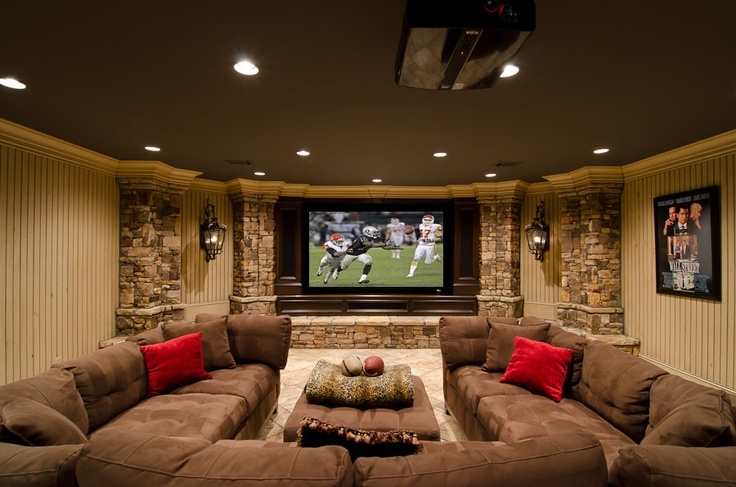 If you are looking to upgrade your existing man cave or planning a remodeling project and want to add one to your home, these awesome features can help inspire you to make yours truly great. When done well, a man cave should highlight a mix of interests and hobbies, and that should be reflected in the style and design. Choose decor that works with the different areas and you can build a room with multiple themes that doesn’t feel disjointed. This man cave keeps neon signs near the bright lights of the arcade games while keeping a classier, relaxed feel right next to it with the bar area. If the designated area for your man cave is smaller than you’d like, you can still do a lot to make the space work. Focus on designs that allow for only a couple purposes, such as making a drink and having a good place to read or converse, to avoid crowding the room. This room makes great use of wall texture and large windows to help make a smaller space feel open and comfortable. One great way to make the area feel like a special retreat from the rest of the home is to highlight different wall textures. This man cave maintains a rustic, luxurious feel while balancing the wood and brick walls. Whether it’s to highlight an HD golf simulator, another gaming area, or a theater room, the brick can work as framing for a key feature of the room. If you are a sports fan and collect memorabilia, it can be tempting to turn the man cave into your own personal sports bar. While there is nothing wrong with that, you can easily create a room that works well for watching the big game as well as entertaining the family. By highlighting only a few jerseys here, this room showcases the owner’s fanship but keeps a sophisticated feel. Focusing on the right lighting fixtures can really open up your man cave and make it more inviting. Different styles of lights can highlight components of the room, as seen here with focal points at the pool table, wine rack and sink area. When done well, your man cave lighting system fixtures will feel like a natural part of the overall design. Your man cave may be spread into separate sections, and the design can work well if they are marked with different flooring options. Use the pieces in different areas to tie it all together, as found in this room. The carpeted area creates a home-like sense of comfort, while the couch color and wooden TV stand connect the theater area to the poker room to tie the whole area together. No matter what design you are looking for, your man cave should be established as an area to unwind and relax, so comfort is key. Choose inviting, comfortable furniture that works well for lounging but can also be moved around to accommodate guests. Looking for design inspiration? Click here! If you have a home office, bringing the workspace and elements of your man cave together can create a great multi-purpose area of the home. Once you retire or stop working from home, you’ll have room to expand and adapt the office into a full blown man cave. This room achieves an inviting sense of comfort that would help any man focus on work and relax comfortably at the end of the day. If you have one thing you are very passionate about and wish you had an area of the home dedicated solely to that, do it incredibly well. The most relaxing man caves will feel like a spot to completely escape and unwind. By creating a wholly dedicated area you can enjoy your favorite things, such as wine while creating an environment to share with friends. If you are renovating part of a barn or your cabin into your man cave, you can use the natural features to your advantage. The design naturally lends itself to a rustic, classic feel that you can accentuate throughout. Rooms like this, though they may not be in your regular home, will feel like even more of a getaway when done well! There is a lot to consider when planning the design for your man cave, but if it serves as a relaxing space that reflects your style and personality you can’t go wrong. What are the must-haves for your own man cave? We’d love to hear what you plan to include in your project!